Hysteria in Connecticut spells trouble for those on the periphery in this debut novel set in the 17th century. 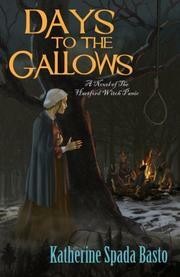 In 1662, two young women witness an unusual midnight gathering on Hartford’s South Green. The merrymaking is taken as witchcraft, and the women, Hester Hosmer and Ann Cole, are soon at the center of a mania that grips their close-knit, Puritanical town. Ann, a troubled girl who was once an outsider, finds herself with power and attention. After a child’s untimely and inexplicable death, Ann begins lobbing claims of witchcraft at the men and women she spied on the green. The foreboding town marshal, the reverends, and the God-fearing villagers all heed her allegations and set out to rid themselves of the supposed evil in their midst. The accused are arrested. Trials, tests, and hangings commence. Hester distances herself from Ann and her smug delight in the success of her charges. As Hester watches the mounting frenzy, she begins to question the actions of not just Ann, but her family and neighbors as well. Her only ally is Tom, the peddler’s son, who urges Hester to leave the fanaticism behind and join him somewhere new and safe. Basto’s novel is a well-written and -researched account of a historical event. The Hartford witch panic is the lesser-known but no less captivating precursor to the Salem witch trials. The author skillfully demonstrates how quickly fear and panic can spread, insidious forces that ultimately leave no one above suspicion. Hester is an excellent narrator, an insider who undergoes a subtle but marked change in her beliefs and perspective. Where others see God’s will, Hester comes to identify deception, prejudice, and alarm. Basto also sets the scene well, bringing the sights and sounds of the Hartford Town Market to life. Her descriptions of the witch trials, including the appearances of the suspects, the rumblings of denunciations, and the damning silence of those who refuse to speak up for the innocent, are clearly and vividly wrought. A superb addition to the historical fiction genre, this engrossing witchcraft tale should appeal to a wide-ranging audience.